Super Solve Degreaser is a low viscosity emulsifiable solvent which is designed for the fast and efficient degreasing of motors, motor parts, chassis and metals. Super Solve is also a highly effective cleaner for garage floors. Super Solve works by penetrating and lifting oil and grease and when rinsed off with water, the oil and grease is emulsified and flushes away with rinsing water. Suitable for metallic and most non-metallic hard surfaces. Use neat. Do not mix with any other chemicals. Can be used with a hand sprayer, pump sprayer, brush or swabbed. Spray Super Solve onto any oily or greasy equipment. Wait 5 minutes to penetrate, then hose off. Stubborn grease might need extra treatment. 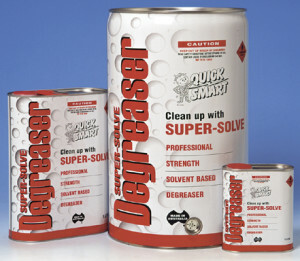 This product may soften some paints – if in doubt test a small area first.